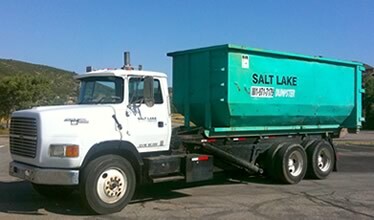 Salt Lake Dumpster offers roll-off dumpsters in Salt Lake City and surrounding areas. 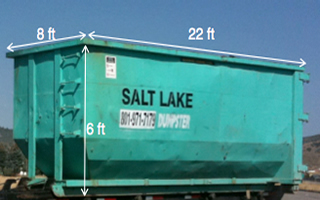 We have 15 cubic yard and 30 cubic yard dumpsters for use at residential, commerical and industrial locations. We offer same day service, and weekly and long—term service. We have simple, fair pricing and easy payment terms. We also offering recycling of materials such as concrete, metal, plastics, cardboard, paper, green waste and wood. Get in touch at (801) 613-8670. Let us know your phone number and zip code, and we'll get right back to you with info and a quote. We'll never sell or share your info. It's private. Have questions? Call or visit the blog. Also used for concrete and asphalt removal and recycling (up to 8 cubic yards per load) for a fixed fee, with no tonnage charge. No trash or other debris is allowed in recycling loads, otherwise tonnage charges will apply. Concrete, asphalt, dirt, and sod in quantities greater than 3 cubic yards (about 3 tons) are not allowed in 30 yard rolloffs! Copyright © 2013 Salt Lake Dumpster in Salt Lake City, UT. 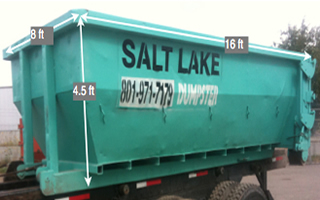 Salt Lake Dumpster is a registered trademark.